The Planet Steel team in last year's Great Knaresborough Bed Race. One of the UK's most 'bonkers' events, the Great Knaresborough Bed Race, is set to go global with a new bed race 'Down Under'. Not only has the town's biggest annual event inspired a copy-cat event in Australia, Knaresborough Lions have also been helping their antipodean cousins organise their first one successfully. Nigel Perry, secretary of Knaresborough Lions Club, said: "The Lions get a few such requests every year from around Britain, the USA, the Continent, South Africa and New Zealand in recent times. "Knaresborough’s twin towns in Germany have also staged bed races. So, it didn’t come as a total surprise. "We were happy to help, sending advice, entry forms, rules, photos and a history of the event." The new event will take place in the small town of Bunbury which lies 9,110 miles from Knaresborough and has a population of 31, 000, nearly twice that of the town that inspired it. The story started when correspondence arrived in the in-box of the Knaresborough Lions last September asking for advice in setting up a racing event for beds. The St John Catholic Hospital in Bunbury in Western Australia was looking for a fund-raising event for its cancer and cardiac care services. The Lions took kindly to the request and were keen to ensure the idea became a reality. 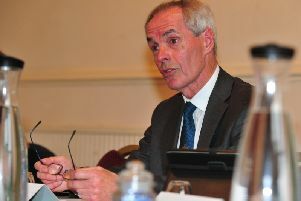 Nigel Perry said:“These requests don’t all come to anything but a few have sparked. Auckland and Gauteng are two that have established themselves of late. “We warned the folk in Bunbury that there was much hard work, but they were undeterred and have moved quickly to organise their inaugural event, timed for April. St John Catholic Hospital hopes to make this an annual event, just as is the Bed Race in Knaresborough. It also plans to roll out the race to use around Australia with its other hospitals. A spokesman for St John Catholic Hospital said: "We'd heard about the famous Knaresborough Bed Race in the UK but khe kindness of the Knaresborough Lions in sharing their expertise is deeply appreciated”. Held every year since 1966, the Great Knaresborough Bed Race garners media coverage around the world on TV, radio, the press and websites. Late last year, the Holiday Lettings division of Trip Advisor made the event " one of the 10 most brilliant-but-bonkers events in the UK." This year’s Bed Race will be held on Saturday, June 10 with a theme of Heroes and Villains.